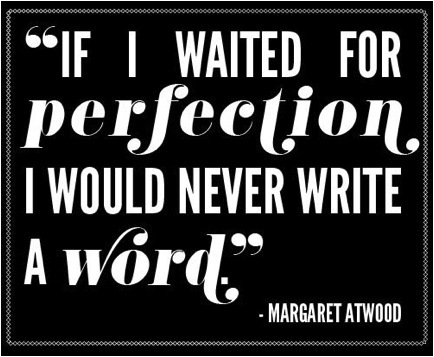 As Margaret Atwood shares with us in some interestingly-kerned type, perfection in writing is difficult to achieve. Her quotation is just one in a plethora of other quotations that frequently come to mind whenever I take a moment to ponder the writing process, such as age-old adage “You’re your own worst critic” or Ernest Hemingway’s “There is nothing to writing. All you do is sit down at a typewriter and bleed.” Mind you, I’m currently at a laptop, but the sentiment is still there: writing is tough. It takes a little pain and a lot of outpouring of something (hopefully soul, wit, and intellect in this case). And writing is even tougher when you desperately want to do it right. Nevertheless, like many good things, it’s also a task completely worth doing and things generally (hopefully?) get easier once you’ve started. At least, that’s what we over here at Tangents are telling ourselves. I personally cannot promise perfection, or anything near it, but I can hopefully promise that whatever ends up here will be an interesting outpouring of some sort. Creativity needs to be cultivated on somewhat of a regular basis and consequently, that’s we’re doing. It certainly won’t be perfection and I doubt most posts will come close—but it will be words! And hopefully, they will delight you. That’s a bit of a dark tangent to roll with—hopefully your lasting impression of me doesn’t prove to be an angsty blogger with blood dripping over the keyboard, but since honesty is the best policy (the adages return!) I figure it’s best to lay my cards on the table straight away. That way, you know what you’re getting yourself into and hopefully you can determine that it’s worth sticking around for the ride—it’s sure to be a fascinating one!